Accommodation - unlimited meals - child care and much more ! There are times when God calls us to go offshore to get something new that He has prepared and wants to impart specific people. People with vision and hunger for new and refreshing waters of the spirit of God to bless their nations and continents. Are you willing to enter into a new dimension in their worship? 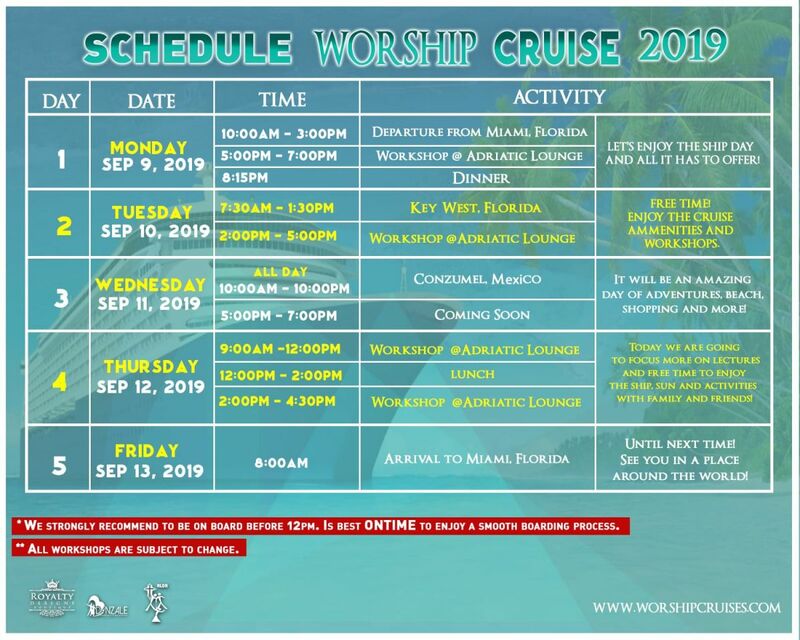 (Hotai) T'HeArts House International and the International Dánzale Ministry, invites you to worship dance cruise on the water - 5 days and 4 nights Western Caribbean cruise departing from Miami, Florida, Monday 9 September, 2019 13 : 00 and returning on Friday September 13 at 8:00 a.m.. It will be an amazing journey that God has the helm, leading to worship him in spirit and in truth. As if this were not enough, we have planned a variety of thematic workshops, lectures and question and answer sessions to praise and faithful in general dancers. Each participant will also have the opportunity (optional) for local projects of practical ministry in the islands we visited! They also have times of fellowship with other members of the ministry with the same passion, take time to snack and relax in a unique atmosphere between the seas. All this on board one of the most beautiful boats, 'victory' Carnival! Hope to see you in this unique historic event in life! There are only 100 spots left for this great offer of $ 399.00 all inclusive. Once you exceed this amount, prices will rise depending on how the occupation on the cruise line. If you choose a different type of cabin, you can still use the payment plan. Make sure your final value fee is increased to complete the payment. According to your request, here are some options are presented per cabin. View all included in this offer for only $ 399.00!  running track, tennis and jogging outdoors Minigolf and more!  art auctions and shops and more!  breakfast, lunch and dinner all inclusive.  cabins (rooms) inside and sea views. The  $ 399.00 per person in the car 4. If you want a cabin for even higher end cabin 1, 2, 3 or window, please contact us for prices.  beaches, pools and more!  special space for young people in the field of sea and Circle C.
 Camp Carnival children of all ages from 9 to 10 hs. Completely free !!! Restrictions apply.  special children's pool, theater, crafts, computer room with educational games.  special pool and playhouse for children.  incredible performances in the two auditoriums. If you registered when the cost was $ 350.00, continue with the previous payment plan and receive your email for the invoice. plan payment will be made through a paypal invoice. 1) Please click Registration red botton below and make your deposit of the total payment . 2) You will receive confirmation of payment and any other instructions via e-mail. 3) Please continue your payment plan with the same ministry has made the first deposit . Be prepared to be part of a historic moment for Christian art !!! All first deposits are 100% refundable up to the date of May 1st, 2019. Ones you make the second payment, it will be advice on your invoice that there is no refund. You are assigned to a Cabin only after the 2nd payment. Groups reservations are being handled by Delki Rosso, INC doing business as Royalty Designs Boutique operating from Orlando, Florida. God is Spirit; and those who worship him in spirit and in truth must worship. "They and their families were able to play music before the Lord ..
- were musicians par excellence "
We're sure you have many questions! Here are some answers to help you plan presented. Then the contact form to send us any questions you may have! We suggest you car pool and save money. We recommend have enough time between park and reach the terminal. Once parked, it will be tranportado by car to terminal. You can also google Parking lots near Terminal for lower rates.  MONEY FOR ANYTHING ELSE? Tipping is customary to extend shipboard personnel for their services. The amount of tipping is a personal matter and depends entirely on our guests. Our recommended what is appropriate guide is $ 12.95 USD per person, per day for guests in standard accommodations in cabins. For the convenience of our guests, automatically we add the recommended host account towards the end of the cruise tips. Does not require that guests under two extended tips. If a guest is not satisfied with the service you receive, you may contact the Guest Services desk while on board. This will allow us to address your concerns in a timely and appropriate manner. A guest 's discretion, can adjust tips at any time while they are on board. Tipping is considered undisputed unless a modification request is received before disembarking the ship. Once you make your complete your payment, we will add you into a cabin as the entire group gets ready. We will then send you an email giving them instructions to print at home all the on board documents. Once on the ship, you will visit the service desk to leave a credit card upon to cover incidenciales, gratuities or other personal expenses outside of what is included on the ship.  HOW SHOULD I PACK? To help you plan, we suggest you limit your luggage to a maximum of one suitcase per person if traveling on cruises 3-5 days, casual and comfortable clothes all day. Suitable suit bathrooms. A suit / suit elegant for a special night. There is no limit of weight or amount of bags you bring on the ship but please be aware that cabins are confortable but tight. To maintain a safe and secure environment, Carnival prohibits certain items on board, such as weapons, candles and plates ,. DO I NEED MONEY FOR FOOD? Unlimited delicious meals on board for free!! We recommend eat before heading out on the ship or have extra money for the beach stops! 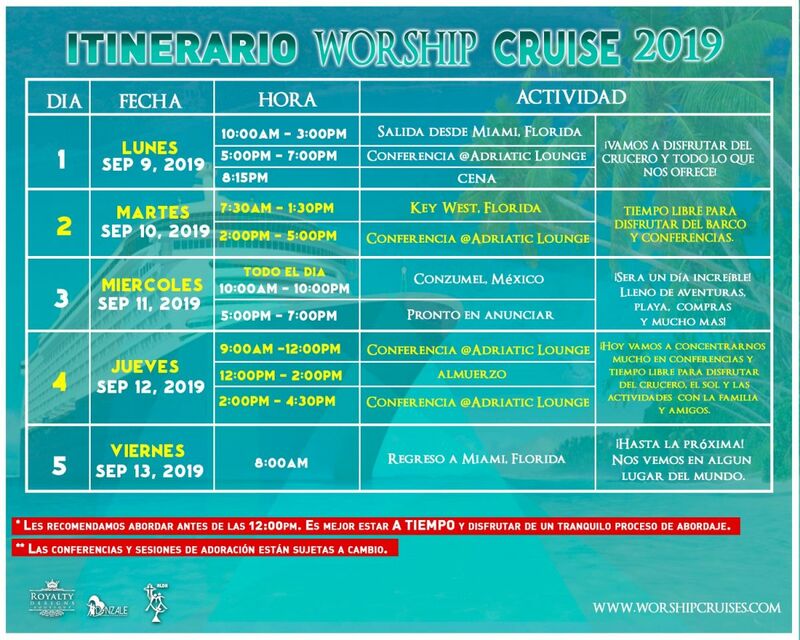 THE ENTIRE CRUISE IS FOR WORSHIP? We do not have exclusivity with the ship. There wil be non-Christian people anda families on thisc cruise. We will keep our testimony everywhere and follow the itinerary given by those who run the event. We pray in the future we can recruete so many people that we can take over the entire ship! CAN I MAKE MY OWN RESERVATIONS FOR THE CRUISE? We have reserved a limited amount of rooms which must be covered by our group. All reservations for this trip must go through us directly to be able to partipate of the conferences. This trip will give you credit as a VIFP Carnival member.  CAN I BRING KIDS? KIDS WILL LOVE THIS CRUISE!!! Carnival has a KIDS CAMP to entertain them while you rest and receive your conferences. *Babies under 6 months are not allowed in the ship. *Kids of 2 years old and older are welcome to the Carnival Camps. Prices for *Kids is the same as adult based on people per Cabin. Special offer of $350.oo per person is based on 4 people per cabin. 2)as well as a government-issued photo ID. Children are also required to bring proof of citizenship and if 16 and over a photo ID is also required. If a cruise begins and ends in different U.S. ports or begins and ends in a foreign port, a valid passport or other WHTIcompliant document is required. A valid passport is required if you are traveling on any of our Europe cruises. All other non US citizens must have a passport for air, land and sea travel. ALL RESIDENTS - NON USA CITIZENS NEED PASSPORTS. Guests under the age of 21 must travel with a relative or guardian of 25 years of age or older. Parent or guardian assumes responsibility for any minors they are traveling with and, may not under any circumstances, purchase alcoholic beverages for any guest under the age of 21. Guests 12 and younger: may travel in separate staterooms. However, minors must either be directly across the hall or next door. Minors may not be assigned to a balcony cabin without a relative/guardian. Guests 13 - 17 years of age: can be booked up to 3 staterooms away from their accompanying adult. Guests 18 - 20 years of age: do not have any restrictions and may book whatever location they prefer. Prepaid gratuities and/or damage deposits of $100 USD per minor guest may be required for minor groups of 8 cabins or more. If you are already registered or have any questions please CLICK HERE add your self to this Whatsapp chat ! Prices per passenger based on four people per cabin . If you prefer a room for 1, 2 or 3 people, please contact us for prices. conference fees, government taxes are already included in the final price of $ 350.00 !!! AIR TRANSPORT not included in the price. Booking through a travel agent for this same cruise, you will not be allowed to enter any event programming. Thank you for supporting Vision and beliving together to make this happen!  +1 (347) 206-8017 Florida, EE.UU.